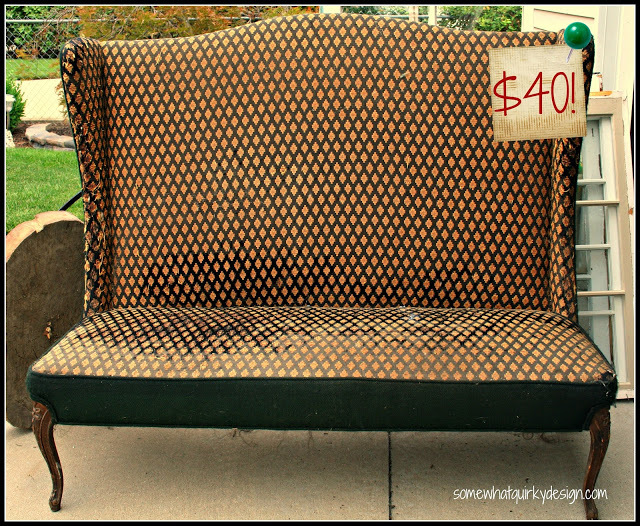 Remember earlier this week how I told you I had been tearing this little settee up? But it was a secret and I couldn't tell you anything else? Well, once I learned that the theme of this month's Fab Furniture Flippin' Contest was "Take a seat" and that the sponsor this month was Minted I knew this was the moment of truth for this sucker. Do you know about Minted? In their own words, "Minted is a design marketplace. We cource creative content from a global community of independent artists, then sell the best content in the form of art, home decor, and stationery, directly to consumers. an early pioneer of crowdsourcing, Minted has held art and design challenges monthly since April 2008. Challenges are open for both submission and voting, the 'crowd' curates Minted's product selection by rating products, and Minted utilizes analytics to evaluate votes." In my words Minted is a great online resource for unique, artistic, modern fabric, artwork, and stationery. You could shop for days and never run out of inspiration. As part of their sponsorship of this months contest Minted supplied each of the participants with FIVE YARDS of their beautiful fabric. All I had to do was pick out which fabric I wanted. Thank goodness I had strict parameters for colors or I may never have been able to commit to a fabric. 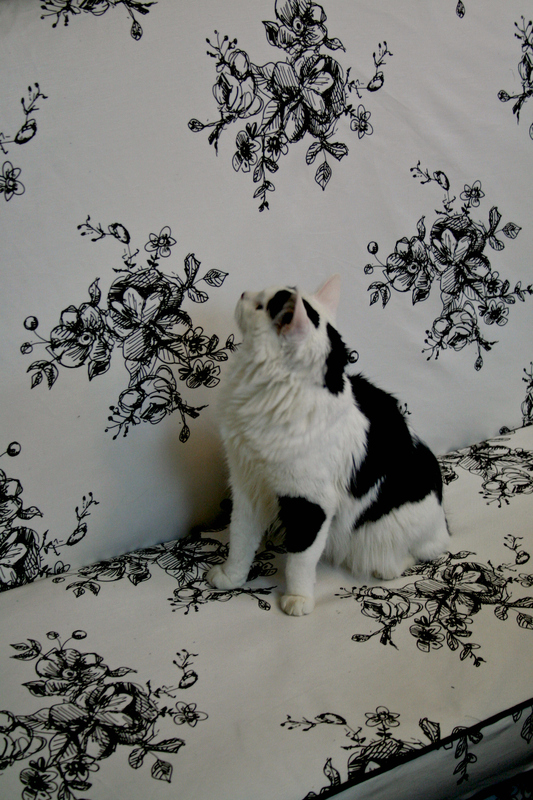 I just identified that I wanted black and white fabric and the site narrowed it down for me. My advice to you is for you to head over there and start playing around on their site, finding patterns, changing the colors, finding just the right fabric for those curtains, that duvet cover, or as in my case that perfect slipcover material for my disgustingly dirty settee. 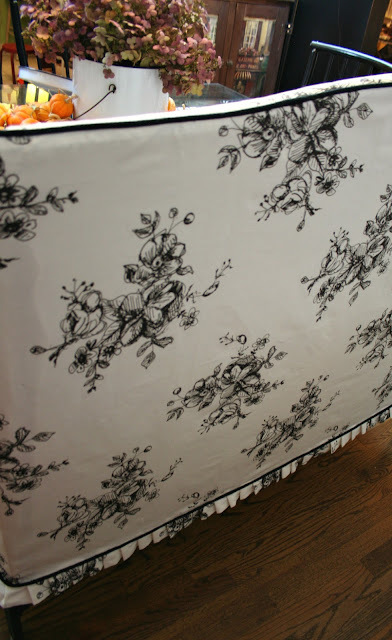 I picked out ellegance illustrated toile. 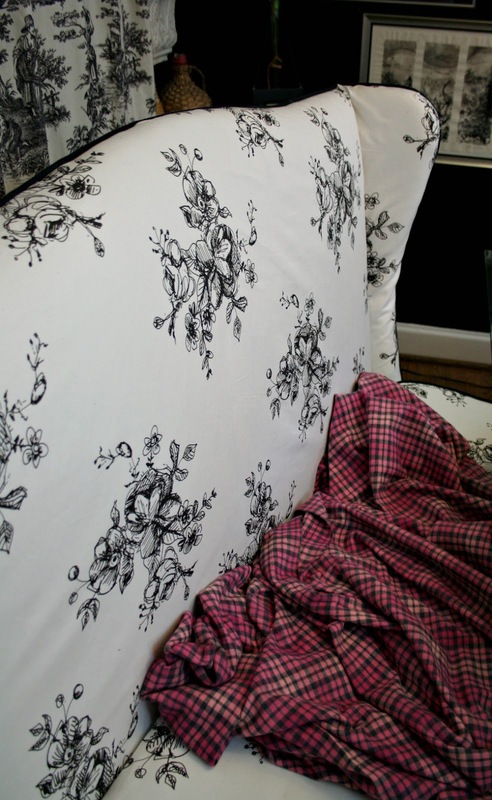 I picked the color and the finish of the fabric, they printed it up for me and it arrived at my house 10 days later. Whoohoo! 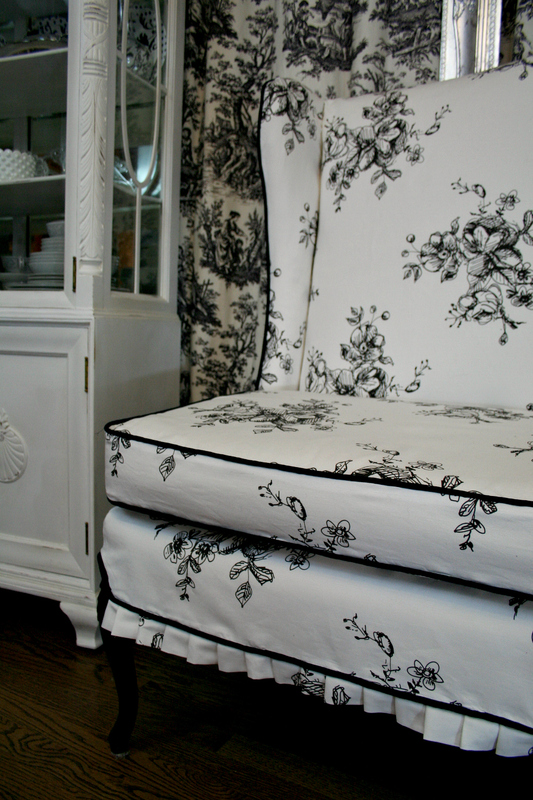 I won't bore you with the gory details of stripping off the old nasty fabric, covering the padding with clean batting, making a cushion because the settee is about 3 inches too low for sitting at the dining table, upholstering the whole piece with canvas duck, and then making 20 yards of black piping, and making a fitted slipcover in my glorious new fabric. I won't tell you how many mistakes were made. How many times I had to rip out seams. I won't tell you that I got most things right the second time. Or that some things I never got right and I'm just going to live with my mistakes . . . 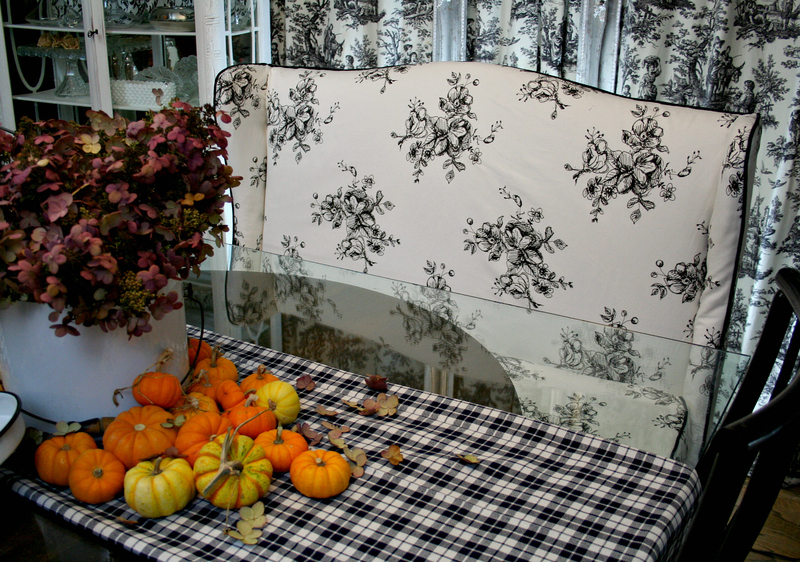 I'm so excited that my Thanksgiving guest will have a cushy little couch to sit on while they eat dinner and fall into a food coma. I'm excited that I'm one step closer to having my dining room all finished. And since I started redoing the dining room about 2012, I'm pretty happy to be closer. Mr Quirky is just glad that it isn't in the garage any longer. Now I have a place to sit and drink wine and look at cookbooks. 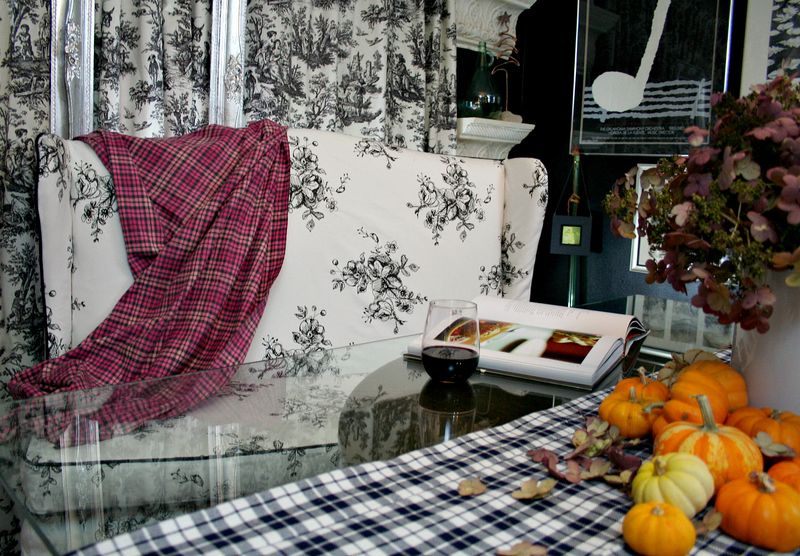 I guess you could call this my wine drinking, cookbook looking, Minted fabric loving, Fab Furniture Flippin' settee. Stop by either place and see what the other November Fab Flippers did with their Minted fabric. You can vote for my piece there by clicking on the heart in the upper right hand corner of my link. 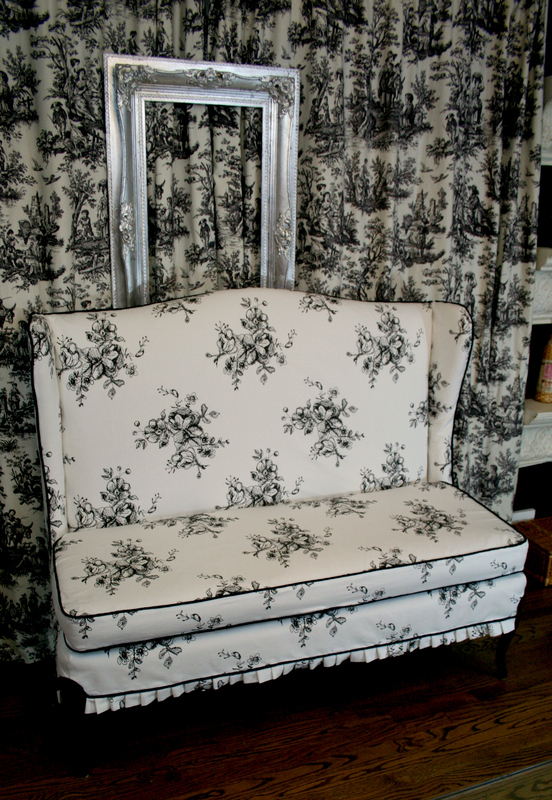 And thanks to Minted for helping me out with my settee and for being such a great website with such great stuff to offer! 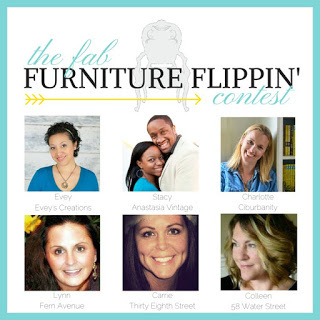 If you would like to participate in a Fab Furniture Flippin' Contest, just contact info@fabfurnitureflippincontest.com and they will take proper care of you! That is soooo gorgeous I cannot stand it!!! I want it! Most of all I want to be able to do that. Thanks for sharing. Just beautiful. I would never be brave enough to take on such a stupendous task! Happy Thanksgiving. Fabulous! I love the fabric. Enjoy Thanksgiving! I love, love love this. What a beautiful job!! Be proud, woman!!!!!!!!!!! 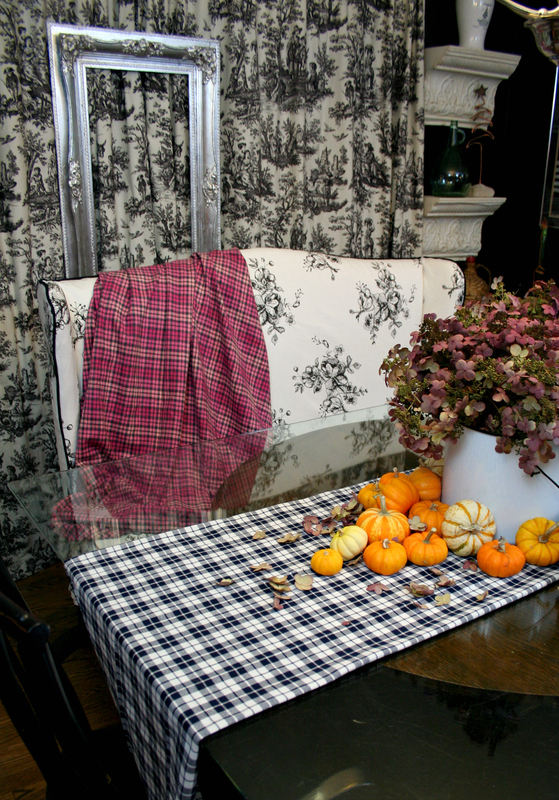 What a fabulous job you did on that bench ... love the colors ... love the fabric ... love that little ruffle ... love it all! WOW! I LOVE the transformation. Beautiful selection of fabric and colors. You did a wonderful job! Karen, this settee is AMAZING. I love the fabric, the knife pleat skirt, the shape of the piece. I was reading your Christmas tour post...definitely missed a few things going on in your world, but had to come back for this and those ornaments you made this year. Really, really nice. Love your color scheme in your home. Happy December!